"Baltic Wharf" in Norwich is a fabulous holiday cottage in the fine city of Norwich, in Norfolk. Sleeping 12 people, Baltic Wharf can be found in the banks of the River Wensum; a 2 minute walk from the city centre, and the bars and restaurants of the Riverside area. An ideal place to explore Norfolk during the day, and to walk to a choice of restaurants in the evening. Baltic Wharf sleeps 12 people in 6 bedrooms - 3 double bedrooms, 2 twin bedrooms and a bunk bedroom. Baltic Wharf has gas central heating, with your towels and bed linen provided. You have a TV, DVD player, stereo system and Wi-Fi all provided. Baltic Wharf has a gas hob, oven, microwave, washing machine, dish washer, and a fridge/freezer. Outside you have a small courtyard garden with outdoor furniture and a hot tub. The photo here shows your hot tub in the garden - making a great place to spend an evening after a day visiting Norfolk. One of the best things about Baltic Wharf (apart from the hot tub) is the location of this holiday cottage. 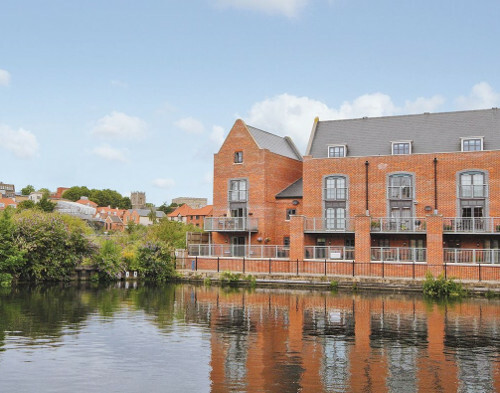 Located on the banks of the River Wensum in the city of Norwich, Baltic Wharf is a modern townhouse on the opposite bank to the Riverside area. Riverside has a whole host of bars, restaurants and entertainment - with TGI Fridays, Wetherspoons pub, Nandos, Bella Italia, Frankie & Benny's and Coast to Coast to name a few; there is also a multi-screen Odeon cinema. The footbridge across the Wensum makes walking access a breeze. The city of Norwich is an easy walk too, with the old castle to explore; or the two main shopping centres in the city. A couple of miles outside Norwich you can head into Trowse and visit the Norfolk Broads. Should you have children as part of your holiday party, a trip to BeWILDerwood could well be on the cards too. The east coast is an easy drive from Baltic Wharf, with the genteel Suffolk town of Southwold being well worth a day out (and the place to head to for a pint of Adnams ale). With Great Yarmouth being ideal if you're after a day at the seaside! Walking and cycling can all be enjoyed during your stay at Baltic Wharf, with Marriott's Way being a 26 mile cycle and footpath taking you all the way into Aylsham. Should Baltic Wharf not be to your liking, but you fancy staying in the area around Norwich, you might well be interested in the cottages below. All these cottages are within a few miles of Baltic Wharf.